The executive summary…for all of us. We have reduced our consumption of electricity by over 18% over the last four years. We have entirely eliminated the use of CFCs and HCFCs in all our manufacturing processes to protect the ozone layer. From the lunchroom to the factory floor, we recycle 88% of our waste production across the organization. 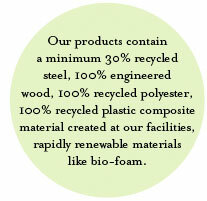 Global’s patented, industry-first, wood/polymer molding technology diverts 7.5 tons of waste per day from the landfill. A constantly expanding textile offering woven from recycled polyester is an environmental option with little or no up-charge to the customer. Our cardboard packing utilizes 80% recycled material and wherever possible we flat pack to reduce shipping volume and minimize our carbon footprint. Our chrome plating facility discharges water that is clean enough to return to the municipal water infrastructure. 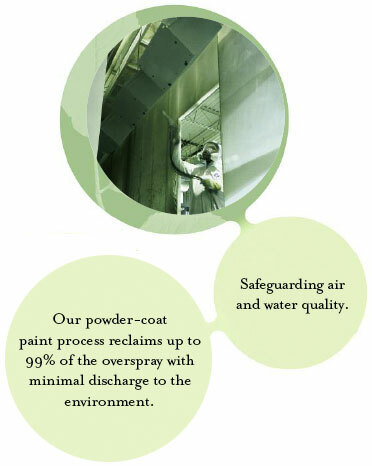 Our non-hazardous powder-coat paint process reclaims up to 99% of overspray with minimal discharge to the environment. We recycle more than 100 tons of fabric, which is recycled through various voluntary programs and partners such as "echoes in the attic". Better Products Better Future Before governments developed environmental protection legislation we were setting our own standards for sustainable practices, developing new technologies and using reclaimed materials to safeguard the environment. From design through to manufacturing we pay particular attention to reducing the impact of our product packaging, the use of recycled and recyclable materials and production processes that minimize energy consumption. A better product is also a green product. At Global we believe we have a responsibility to safeguard the environment in the course of manufacturing and doing business. That's one of the reasons we created the Global Group Environmental Committee; to keep us focused on manufacturing high-quality products at a great price and in a sustainable manner. The Environmental Committee has members recruited from across the organization, from the factory floor to senior management and reports directly to the Chairman and CEO. In simple terms, it's a fully integrated component of our operations, financial planning and expenditures. A piecemeal approach to sustainability can't work. The Global Group Environmental Committee promotes communication and cooperation among Global divisions and whether it’s a way to save energy in one facility, or conserve materials on an assembly line, the Committee encourages the sharing of ideas, practices and technologies that protect both the environment and the health of our people. Of course we're taking the customary steps to save energy; replacing metal halide lights with energy efficient fluorescent reflective fixtures. That alone saves tens of thousands of dollars of energy a year. But we're also reducing energy consumption with some innovative thinking of our own. Energy Management Reducing our energy consumption has been a corporate priority, and therefore, several initiatives have been implemented to assist us in achieving our target. As a result, we have met and exceeded our 10% energy reduction target per year since 2010. Process energy (used during manufacturing processes) has been reduced by 51% over the past four years. Energy Star Portfolio Management is used by Global to measure our building energy performance against other facilities with the same characteristics. Our facilities are ranked above the national average. Finishing our products in ways that protect our air and water. At Global we use powder-coat paint finishes for the majority of products; a process that recovers and reuses 99% of the overspray with minimal discharge to the environment. Powder coating is a clean electrostatic process that offers a superior finish and uses no solvents or CFCs. Some components and finishes, however, necessitate the use of our “GEL” paint lines. Here 85% of the overspray is captured and transferred using compressed air technology to a 300-gallon tote. Our paint supplier checks it for quality and color match and recycles it back to us for painting drawer bodies, hanging rods and other less-visible surfaces. One fundamental responsibility in minimizing the environmental impact of our manufacturing processes includes carefully managing our wastewater. At our chrome plating facility metal-salt baths are constantly monitored to prolong the life of the plating solution. In fact, the water released from our chrome plating plant is clean enough to return to the municipal water infrastructure. Water Management Through programs such as the Design for the Environment, Training, and Technology Replacement, we have been able to accomplish our target and reduce our process water by 5% per year since 2010. Our closed loop manufacturing drastically reduces waste. We’re not new to the game. We were in recycling long before it came into style. In 1993 we developed a patented technology that takes recycled plastic and combines it with post-production wood waste from our wood manufacturing facilities. This new composite material is injection molded and utilized in everything from panel frames to chair components. It’s not pretty to look at, but it’s very strong and it’s inside where it counts. Using this innovative reclamation technology we’ve been able to divert 7.5 tons of plastic and wood waste per day from the landfill, which translates into 2000 tons a year! In fact this technology has been so successful that Global is now recycling waste for other companies. 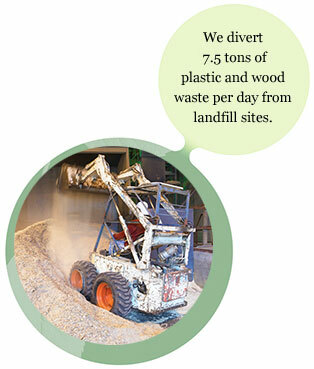 Our Goal is to have 100% production waste diversion from landfill by 2014. We are pleased to report that this target was accomplished since 2012. Bundling up our scrap textiles for recycling was a first step in dealing with our production waste but we knew we could do better. So we actively sought a way to turn our scraps into something useful. 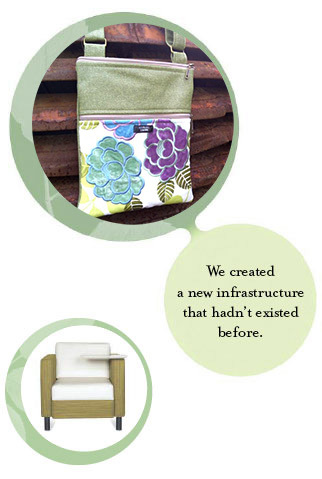 We formed a partnership with Echoes in the Attic™, an eco-retailer who uses textile scraps in their handbag and pillow designs, and created an entirely new infrastructure that hadn’t existed before. At first, the mountain of fabric offcuts that Global produced seemed like an endless resource to a small entrepreneurial business, like Echoes in the Attic™. But Echoes has been so successful that now we can barely keep up with their demand! It’s an example of how even an organization as large as Global needs to look beyond its own four walls to find new solutions. More than 1,000 Environmental Data Sheets have been created to show the recycled content of the components that formed our products as well as LEED credits. Our products are designed based on our DfE (Design for the Environment) program, which promotes environmentally sound decisions at every step of the process. This translates to having more than 200 products certified under level™ 2 as well as Greenguard. Our material components are 100% recyclable. The Leadership in Energy and Environmental Design (LEED) Green Building Rating System is the new benchmark for sustainable buildings. LEED certification is a system for evaluating the impact a building has on the environment, it’s use of energy and water and how it contributes to people’s health and productivity. Global helps our customers meet LEED requirements by providing a wide range of Greenguard-certified products, specified in the LEED Green Building Rating System. Global’s LEED Partnership Program offers project management support to architects and specifiers in obtaining LEED certification. Every new product that’s made consumes both energy and materials in its manufacture. If we are to achieve a sustainable future and a good quality of life, the products we make must have a meaningful lifespan. At Global we make intelligent products that are designed and built to meet real needs and whose life span is appropriate to their use. Moreover, when we design products to be assembled we also design them to be easily taken apart so they can be serviced. Taking responsibility, as a manufacturer, for the resources we use and the products we create through cradle-to-cradle analysis of resources and a product take-back program. Providing sustainable Greenguard-certified products to help developers, architects, designers and planners achieve LEED certification for new buildings. Using our purchasing power to support third-party suppliers in their innovation of sustainable products and technologies. Taking our core values for environmental health & safety management and including our commitment for social responsibility. Global defines corporate social responsibility (CSR) as the balanced integration of social and environmental considerations into business decisions and operations. Global supports and promotes social accountability standards and applies these guidelines and requirements to the organization to help achieve its sustainability goals and business aspirations, thereby improving social and environmental conditions. Our social responsibility policy is a core part of our commitment to support and develop a sustainable future for the company, while balancing social dimensions in our local communities. Global is committed to social responsibility, and as such, we strive to uphold our social, ethical and environmental conduct as outlined in our Social Responsibility Guidelines. Labour and Human Rights Global shall comply with and uphold all applicable standards, laws and regulations related to human and labour rights. We shall comply with all applicable child labour laws, including those relating to young workers, minimum age limits, limitations of hours worked, and prohibitions against certain types of work, including forced and compulsory labour. Diversity, equity and inclusion Global is committed to being an equal opportunity employer and will treat our employees with respect and dignity. We shall promote employee diversity within our operations via the Employment Equity Committee and will not tolerate any forms of discrimination, harassment or abuse. Global's goal is to work toward an environment of inclusiveness for all of our people, regardless of culture, race, colour, sexual orientation and gender identity, family status, age, disability, or faith and religion. Our 10% GHG emission reduction target has been met and exceeded per year since 2010. Thanks to our transportation management program, we have been able to track and reduce by 6% our GHG emissions from transportation. Our Chemical Management program allows tracking chemicals of concern for both humans and the environment and ensuring the correct management of the chemicals as well as the establishment of reduction of targets. Global's corporate social responsibility program covers a full range of aspects, such as employee health and safety management, labour and human rights, inclusiveness, engage in community outreach and involvement as well as supply chain social responsibility practices. Supply Chain Development Global encourages its suppliers and subcontractors to share this commitment and to improve their practices and performance on social, ethical and environmental issues. We encourage our suppliers and subcontractors to exhibit leadership in social responsibility through communication, their activities, and goods and services while maintaining a competitive position in the market. FSC® is an independent, non-governmental, not-for-profit organization established to promote the responsible management of the world's forests. The FSC® certification allows Global to supply products made of wood that come from FSC® certified forests and other responsible sources through a chain of custody (COC). Global further demonstrates our commitment to sustainability by sourcing wood from responsibly managed forests. Our goal is to increase our FSC® certified manufacturing facilities and eliminate unwanted wood sources. Our commitment is demonstrated through our wood policy. level™ certification, based on the ANSI/BIFMA e3-2012 furniture sustainability standard, sets furniture manufacturers on a path toward greater sustainability over time. Based on environmental and social criteria set forth in the standard, a product’s entire supply chain is assessed. Certification assessment includes an evaluation of specific corporate policies and guidelines and an assessment of associated company manufacturing facilities. Products must meet quantifiable milestones of environmental and social performance at every step of development. The quantitative assessment addresses four categories: material use, energy and atmosphere impacts, human and ecosystem health and social responsibility. Manufacturers earn points in each of the four categories. The level™ brand and its numeric rating of 1, 2 or 3 indicate what threshold of certification a product has achieved. level™ 3 is the highest rating. The GREENGUARD mark means that a product has been tested using stringent environmental chamber methods and found to meet GREENGUARD’s Indoor Air Quality Standards. GREENGUARD Certified Products are low emitting and contribute minimal levels of pollutants to indoor environment. Has the product been tested in the last 12 months? Has the product been proven to emit acceptable levels of VOC’s and formaldehyde? ISO 14001 is an international environmental management system which assures our customers that they are buying products from a company that cares about the environment, enhances the company's image and saves money. Global Furniture Group products are by nature designed for a long life. Robust engineering, practices, modular design, practices, testing (including meeting and exceeding BIFMA standards) and design for serviceability have always been part of Global Furniture Group's product development process. Details of these processes are documented as a formal procedure. Systems furniture is designed for change because of the ability to rearrange upgrade and augment as office needs evolve and change. For example, removable elements, fascias and trim allow functional change (acoustic to glazed, door module to solid fascias, etc.) and refresh new fabrics or repairs as needed. New products and components are usually retrofitted to existing furniture. Wiring can be added if more circuits are needed, with minimal disruption and downtime. Wood casegoods and tables are designed for change and longevity, allowing organizations to relocate and rearrange their offices. An initial investment is not made obsolete because of the ability of products to withstand extended use / reuse and refinishing. Global Furniture Group continues to support customers who purchased the product many years ago. Components can be upgraded as modern trim and elements with a different profile transform the product. Elements and other core components such as fabric can be refurbished; extending the product’s life at a fraction of the new product’s cost. The basic warranty for our general products is a lifetime warranty (details available at www.globalfurnituregroup.com), indicating a commitment to durability and upgradeability. There are exceptions for parts with expected service lifetimes: i.e.., fabric, wood finishes, slides, chair mechanisms and cylinders, etc.). These parts and other warranty claims are serviced through customer service. To further facilitate customer access to new or replacement component parts, contact the Customer Service Department or go to our website www.globalfurnituregroup.com. Details of orders and part pricing are sent to the dealer within 24 hours where quick delivery orders are then placed. The LEED (Leadership in Energy and Environmental Design) Green Building Rating System® is a voluntary, consensus-based national standard for developing high-performance, sustainable buildings. A leading-edge system for designing, constructing, operating and certifying the world's greenest buildings. Created by the US Green Building Council and adapted for Canada by the Canada Green Building Council. To facilitate positive results for the environment, occupant health and financial return. Define "green" by providing a standard for measurement. Prevent "green-washing" (false or exaggerated claims). Promote whole-building, integrated design processes. Estimated $29 - 168 billion in national productivity losses per year. Providing a healthy workplace improves employee satisfaction. Increase retail sales with day lighting. Studies have shown 40% improvement. Design and construction practices that significantly reduce or eliminate the negative impact of buildings on the environment and occupants. Improves public health and quality of life through lowemitting products. Environmental benefits: Reduce impact on the environment. Economic benefits: Improve the bottom line and reduce operating costs. Health and safety benefits: Enhance occupant comfort, decreased vacancy and improve retention. We can all breathe easier knowing that Global products are Greenguard compliant. The Greenguard program is run by a worldwide independent organization that rigorously tests materials according to government guidelines and measures harmful emissions such as formaldehyde, volatile organic compounds (VOCs) and carbon monoxide. Global is pleased to announce that 98% of our product offering is Greenguard Certified. This certification indicates good indoor air quality to contribute to a favorable productive environment and enable building occupants to experience a level of comfort. This allows Global to meet indoor air quality requirements of LEED-CI (Leadership in Energy and Environmental Design). For a full listing of our Greenguard certified products, visit www.greenguard.org. ISO Certification ISO 14001 is the benchmark international standard for the implementation and operation of an environmental management system. Certification requires a commitment to continuously improve practices that protect the environment. To meet that responsibility specific environmental objectives and targets need to be set, as well as a program to reach those goals and a system that evaluates both the process management and results. At Global we’re proud to say we’re ISO 14001 registered. 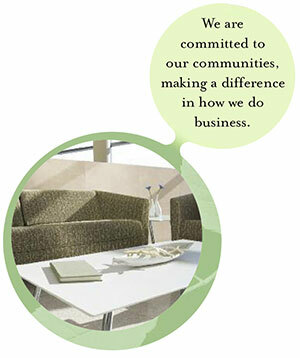 Material Chemistry is also essential in our design process and commitment to social responsibility. We assess the chemicals in our products down to 100 ppm. This evaluation has led us to the reduction of hazardous waste as well as air pollutants by 35% and 67% respectively. A graduated rating system designed to recognize hotels, motels and resorts that are committed to improving their environmental and fiscal performance. Global (Hospitality) has recently become the only furniture manufacturer to-date to be certified under the hospitality's Green Key program. Global products can now contribute to a hotel's operating and sustainable ratings helping them garner higher eco-ratings. Based on the results of a comprehensive environmental self-assessment, hoteliers are awarded a 1-5 Green Key rating and provided with guidance on how to "unlock" opportunities to reduce environmental impacts and operating costs through reduced utility consumption, employee training, and supply chain management. Upon completion of the program and being awarded their Green Key Rating, an on-site inspection may be conducted to confirm the rating. Green Key is the only program of its kind to conduct on-site inspection and validation of ratings in Canada and the United States. In Canada, on-site inspections are currently conducted in the provinces of Nova Scotia, Quebec, Ontario, Manitoba, Saskatchewan, Alberta, and British Columbia. We’re reducing the amount of packaging we use. Global is “flat packing” more and more of its chairs, reducing carton size by 50 to 75% with equal reductions in transportation energy and related CO2 emissions. And we’re ahead of the curve in using reclaimed materials in packaging. Most government and regulatory bodies require 50% recycled material to be classified as recycled. At Global all our cardboard shipping cartons contain at least 80% recycled materials. We print our cartons with water-based inks which break down more easily for recycling and do not contain harmful solvents or heavy metal based pigments. And we go one step further. On customer request we ship products in reusable blankets which eliminate cartons altogether. Global “flat packs” to reduce shipping volume by as much as 75% to save transport energy and reduce pollution. We use water-based ink that contains no harmful solvents or heavy metal pigments to print our cartons. And wherever possible Global ships with reusable blankets to eliminate cartons altogether. 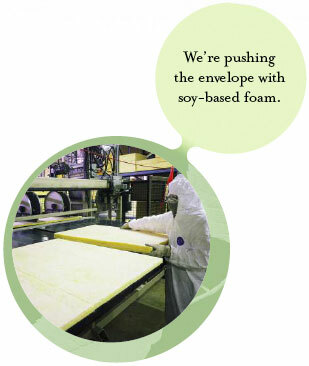 At Global we produce millions of chairs every year, which means we use a tremendous amount of upholstery foam. When you use that much of any material you need to take a really hard look at it from an environmental standpoint. All of the foam upholstery material used in Global products is 100% free of CFCs (chlorofluorocarbons) to preserve the earth’s ozone layer. We’re also pushing the envelope by initiating the use of soy-based compounds in foam and water based glue adhesives to reduce our reliance on petro-chemical based polymers. It’s not an easy change but we’re working hard at it. Our packaging utilizes 80-100% recycled cardboard and 100% reusable blankets. Our product disassembly instructions are designed to encourage our consumer to recycle each part of the product at end of use. Through our End of Life Program, we have been able to re-distribute, where possible, redundant product to national and international programs that assess the most appropriate life cycle channel available as an alternative to sending furniture to landfill. As part of our supply chain management, we ask our suppliers to identify the chemicals in their products and concentrations. This information allows us to assess products for human and ecosystem impact. In addition, we also request that they supply us with information about their environmental certifications and initiatives, thus ensuring our suppliers follow the same standards that we hold so dear. In this age of outsourcing, the environmental policies and practices of many offshore companies raise some very real concerns. 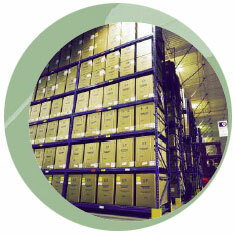 Global requires that all our business partners supply products and services that meet our own environmental standards. As an industry leader, our purchasing power enables our suppliers to invest in new, sustainable technologies within their own areas of expertise. Good examples are the strong relationship we have with our partners in the textile industry that has accelerated our use of recycled fabrics, and the melamine supplier for our desking products that is a three-time winner of the Recycling Council of Ontario Award of Excellence. These partnerships have played a key role in what we commonly call the Global Family. Unlike many imported products Global has a North American parts and service department to extend the useful life of our products. 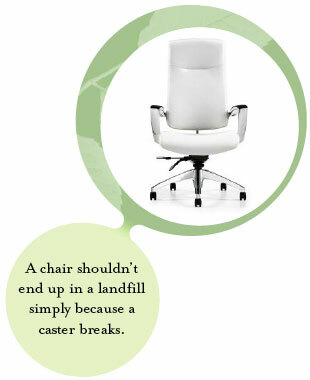 There is no reason that a chair should go to a landfill simply because a caster breaks or a control lever snaps due to some unforeseen incident. And every Global product is BIFMA approved to ensure durability, safety and a long life. When Global began manufacturing office furniture we started with a simple philosophy: build a quality product that the average person could afford. Four decades later that same philosophy is an integral part of our social responsibility and commitment. Values, Ethics and Integrity Global shall strive to maintain highest ethical standards and strictly comply with all laws and regulations on prohibited business practices. The company will strive to demonstrate good corporate governance, transparency, and accountability, including business codes of conduct. We lead by example, at all levels acting in a way that exemplifies what we expect of each other. We work collectively, bringing out the best in each other and creating a strong and successful working relationship. We respect the people we work with on a day-to-day basis for who they are and for their knowledge, skills, and experience as individuals and as teams. We aim to manage all situations professionally, constructively and with candor. Above all, we act with integrity, constantly striving to be open and honest in our communication, sharing information, advice and insight. Community outreach and involvement Global takes great pride in our community outreach and involvement throughout our company and supply chain management processes. We are committed to our communities - acting as responsible corporate citizens and broadening our skills, experience, and perspectives through work in our communities. Our ongoing goal and commitment is to continually perform as a good corporate citizen, making a difference in how we do business and making a positive contribution to benefit our company, our employees and their families, the environment and the community at large. Health care facilities, such as Hospital for Sick Children, Mount Sinai Hospital. Children's aid, such as Starlight Children's Foundation of Canada, Ronald McDonald House. Socially active charitable organizations, such as the Salvation Army and the United Jewish Appeal. The Company also directly makes charitable donations, employees contribute with fund-raising initiatives, such as "Casual Fridays", with money being collected, cheque's issued to charities in the Greater Toronto Area and these donations are reported on the Company's intranet and employee newsletter. Recipients of these employee charitable acts include: Crohns and Colitis Foundation, Multiple Sclerosis Foundation and Prostate Cancer Research Foundation and the Save the Children Fund. The Company and its employees have also donated monies to the United Way, Red Cross and other organizations following major catastrophes overseas such as the catastrophic Tsunami in South-East Asia (for its employees of Tamil origin from Sri Lanka) and for a devastating earthquake in central Italy (also for its employees of Italian origin). Health-related: The Kidney Foundation of Canada, Ferrari Maserati of Ontario Rally for Sick Kids (hospital), Baycrest Pro-Am Hockey Tournament, Brain Tumour Foundation. Education and rehabilitation-related: The Angel Foundation for Learning, Sanfilippo Research Foundation, Reach for the Rainbow and the Herbie Fund. Privacy and Confidentiality Global will protect the privacy and confidentiality of employees and information in compliance with applicable privacy legislation, irrespective of the source of the information. We shall consider all non public information to be confidential. The company shall abide by all laws governing privacy matters (eg. PIPEDA). Health and Safety The health and safety of our employees, contractors, suppliers and visitors is of the utmost importance to Global. We ensure that company policies and procedures and communicated to and adhered to by all persons working for and on behalf of the organization. Global acknowledges the need for the industry to be environmentally responsible for the welfare of future generations as well as providing a work environment that is safe and healthy and free from violence and harassment for all employees. The information provided represents a high level summary of recycling materials presented in Global products. Other end-of-life opportunities for our products have also been highlighted for whenever reuse and refurbish options are not possible. The website sources provided in this document are considered aid tools for customers to access additional disposal options and recovery values for recycled materials. These sources are not controlled by Global. As such, information on these sites can vary. The Ontario Toxics Reduction Act and Ontario Regulation 455/09 requires Ontario companies to annually track, quantify and report the amount of toxic substances used, created, released and contained in product. The TRA reports are based on our submission to Environment Canada's National Pollutant Release Inventory (NPRI), augmented by data from other information sources such as Material Safety Data Sheets (MSDS), Purchasing Department records and production data. Please click on the links below for excerpted information from our TRA reports, which provides data for the priorty toxic substances required to be reported. 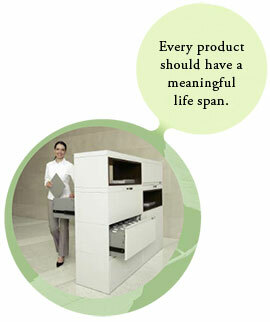 Global Furniture Group products are by nature designed for a long life. Robust engineering practices, modular design practices, testing (including meeting and exceeding BIFMA standards) and design for serviceability have always been part of Global Furniture Group’s product development process. Please review the attached documents for more information on the design of our products. The Global Test Facility is accredited by the Standard's Council of Canada for specific tests or calibrations as listed on www.scc.ca. This laboratory provides the ability for testing Global products. Staffed by experienced test personnel that are committed to provide exceptional service to our Global manufacturing facilities by consistently meeting or exceeding quality furniture testing. With 13,400 square feet, the Global Test Facility is located in the heart of Global’s manufacturing operations. The Global Test Facility engages in the development of test programs combining different standards and techniques to evaluate the function, safety, durability and structural adequacy of office furniture products and also provides accurate comparisons to determine the most suitable components for specific products. 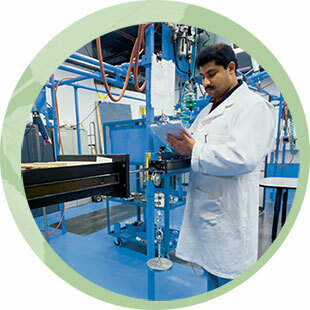 Global's quality inspectors extend the work of the Global Test Facility to the production process itself. The inspectors constantly monitor and inspect all of Global’s production lines, components and products as well as those products received from outside suppliers. Finished products are randomly selected for testing on a 30, 60 or 90 day cycle in order to verify the integrity and safety of components for production. Our Quality Management System is recognized by the International Organization for Standardization (ISO) through registration to ISO 9001:2008. This standard defines quality requirements from the design and development phase through to testing and delivery to the customer. At Global, quality inspections are performed during all operations and processes from the receipt of raw materials from suppliers until the product is shipped to the customer. A proactive approach to quality identifies recurring problem areas and Global develops appropriate and sustainable solutions, applying them to the manufacturing processes to eliminate repeat problems. Global's rigorous testing and quality initiatives are an essential part of its philosophy to provide customers with products built to stringent standards of performance, safety and durability. ISO 9001 is a quality management system developed by the (International Organization for Standardization) which is the largest developer and publisher of International Standards. Management shall ensure that all personnel are fully briefed and understand Global Upholstery Co. Inc.'s policy, objectives and commitment to quality.